Bring the sea to your party by dressing up for a nautical themed party or even adding a little something extra to your nautical costume! Make a splash with our selection of nautical party apparel, sure to impress any guest! Be the center of attention with our nautical beads! Mix and match these fun beads for an under the sea effect! Layer these beads with other blue beads for a look that is truly oceanic. Make sure you also check out our selection of nautical hats! These hats are perfect for transforming you from a human to an under the sea creature with our fish hats or for adding the finishing touch to your sailor costume! We carry a variety of Sailor Hats in assorted colors that are fun for all ages! Make sure you give your party guests a small gift for coming! The Cruise Ship Party Pass is a great souvenir from any nautical themed party and gives your guests a pass to cruise into the party. Hey there skipper! Where is your captains hat? You can't go to a nautical theme party without the appropriate attire and a cheap captains hat is just what you need to take command of the party. For the nautical ladies that would prefer something a little more stylish we have the Mini Sailor Hat Hair Clip which simply holds on to your hair with the included clip and the Patriotic Sailor Hat Hair Clip for all the ladies who are proud to serve their country!We also have a selection of sailor hats for those who are enlisted as the crew of the ship. Check out our Neon Sailor Hat for a recognized accessory that has a pop of color. If none of these hats are your style, check out the traditional White Sailor Hats. Then finish off your whole costume with some Red Crab Beads. Have some fun at your next party and have guests wear our Fish and Crab hat. The cooky hats will be a hit at the party! Or use this nautical apparel for party favors. 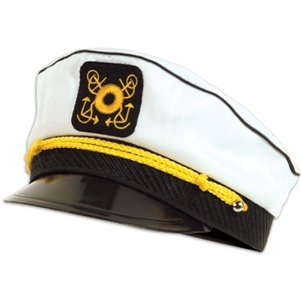 We have classic sailor hats for any nautical themed party or Halloween costume. All of our nautical apparel is inexpensive and will match any costume you have!